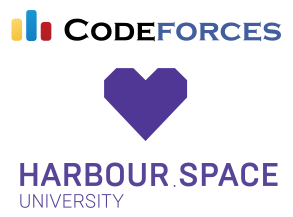 I am pleased to announce a long term partnership with Harbour.Space University and Codeforces. Harbour.Space is supporting the return of a new series of educational rounds on Codeforces! They will take place with the regularity of ~2 times per month with the first round on 14:35 UTC, 27th of March, 2017. Our ability to process such problems are limited, so actually the test suites from the jury are expected to end up incomplete — we are looking forward to your hacks! In February I had a new and wonderful experience of coaching top teams at the Barcelona ACM-ICPC Bootcamp hosted by Harbour.Space University. I was really impressed by the university, participating teams and fellow coaches from our community such as Endagorion, GlebsHP, Michael, Jacob and snarknews that were also there. During the bootcamp it became clear to me that Harbour.Space University is a new type of university that’s reinventing the university experience. It is a modern, adaptable and flexible university that is doing amazing things in preparing talented students for careers in Computer Science, Data Science and Cyber Security. All of their programs are developed in collaboration with the industry and are taught by the top professionals in the respective fields such as Viktor Kantor, Edith Elkind, Alexander Kulikov, Alex Dainiak, Sergey Nikolenko, Deepa Gupta and many others. I am delighted to be joining Harbour.Space fantastic faculty. Together we are developing a series of courses on competitive programming in addition to the bi-annual ACM ICPC Bootcamp that will be hosted by the university in Barcelona. Server time: Apr/22/2019 14:08:06 (e2).